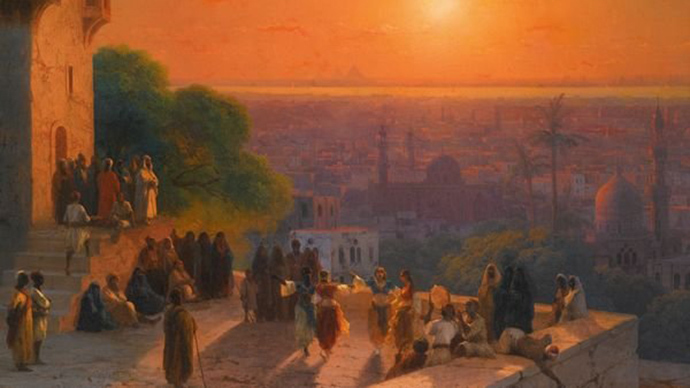 Sotheby's auction house said it will proceed with the planned sale of the "Evening in Cairo" by the celebrated Russian seascape artist Ivan Aivazovsky. Moscow had earlier said the masterpiece was stolen from a private collection in 1997. The Russian branch of Interpol urged British police to assist it in blocking the auction, but Sotheby's insisted it had tracked no record of the painting in databases of stolen art, including one distributed by Russia's Culture Ministry. According to the official representative of the Ministry of Internal Affairs, Elena Alekseeva, the painting was stolen from a private collection in the Russian capital. Praised for his technique to capture sunsets and moonlight, Aivazovsky created his "Evening in Cairo" in 1870. The sought-after painting is due to be sold in London next week, with a pre-sale price estimate of 1.5-2 million pounds ($2-$3 million). Sotheby's website lists the work's provenance as the collection of N.I. Dedov, who owned the painting at the beginning of the 20th Century. It's believed that in the 1940s "Evening in Cairo" was purchased by Ivan Nosenko, a high-ranking official, who was part of the Soviet elite at the time. After his death in 1956, his widow became the sole owner of the painting. "Sotheby's offering of Aivazovsky's 'Evening in Cairo' on the 2 June 2015 will proceed with the agreement of both the Nosenko Family and the consignor," Sotheby's said in emailed comments, according to Reuters. In 2012, Aivazovsky's 1856 tour de force “View of Constantinople and the Bosphorus” sold for a record-setting $5.2 million at Sotheby’s, having doubled the estimate.